To celebrate Open Education Week, Knovation announces the integration of the Knovation Content Collection with Google Classroom and Canvas, decreasing the challenges related to incorporating digital resources into instruction. The integration streamlines access to educator-vetted digital resources from widely-adopted solutions, simplifying the design and delivery of lessons in digital learning environments. Embedded within the Canvas learning management system, the hundreds of thousands of professionally-evaluated, standards-aligned online resources from the Knovation Content Collection can be seamlessly accessed by teachers and students, eliminating the need to navigate an additional interface. By providing the content collection within the easy-to-use Canvas learning management system, relevant and engaging online resources, including Open Educational Resources (OER), are readily available to be incorporated into Canvas courses. Districts with access to the content collection can also easily integrate online resources into Google Classroom, a blended learning platform that simplifies creating, distributing and grading assignments in a paperless way. Through single sign-on, educators are able to select educator-vetted, standards-aligned online resources and easily include in their Google Classroom assignments. According to the CoSN 2015 K-12 IT Leadership Survey Report, 84 percent of school technology officials believe that at least half of their instructional materials will be digital in less than three years. This means districts will very likely continue to face increasing challenges to evaluate, organize and maintain a comprehensive body of digital resources. Through integrations, Knovation aims to ease a district’s transition to digital instructional materials. The Knovation Content Collection is available through solutions and platforms including Canvas and Google Classroom, and through the company’s award-winning solutions netTrekker and icurio. 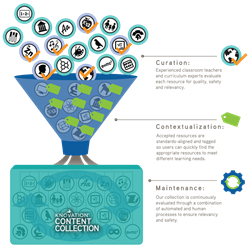 For more information on the Knovation Content Collection, visit http://www.knovationlearning.com/solutions/content-collection. Knovation makes it easy to find, organize, and share free digital content for learning. Knovation’s curriculum experts professionally evaluate, tag, standards-align and continuously maintain a collection of hundreds of thousands of online resources covering all subject areas, all grades and all learning resource types. The Knovation Content Collection can be accessed through the company’s award-winning solutions, netTrekker and icurio, or through custom integration with learning management systems and assessment platforms. Since 1999, Knovation has delivered on the promise to do something good for kids, every day by helping districts meet the needs of diverse K-12 learners in digital learning environments. For more information, please visit http://www.knovationlearning.com.